This week, Timeless returned from its mini hiatus—which felt a lot longer than two weeks to be honest—with another sharply written and tightly plotted addition to its second season. 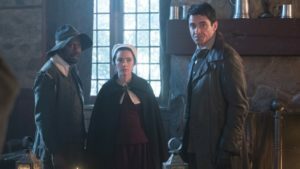 One of the strongest aspects of season two has been its focus on the characters, and “The Salem Witch Hunt” is yet another perfect example of how the side characters on Timeless don’t feel at all like side characters. Everyone has their role to play and the storylines wouldn’t work without them and the dynamics (or conflict) they bring. Characters—Jiya is a standout in particular—who weren’t featured much in season one get their own deserved arcs and room to breathe and develop in ways that directly impact the plot. “The Salem Witch Hunt” gives us a lot to unpack emotionally. Still left reeling from that twist last episode where Wyatt’s wife Jessica was revealed to be alive (just when Team Lyatt was finally getting somewhere, doesn’t it figure? ), the reunion between the two doesn’t exactly go as planned. As it turns out, Wyatt’s been gone for two months and their marriage before his unexplained disappearance has been anything but blissful. Jessica hands Wyatt divorce papers and tells him that he’s put her on a pedestal, romanticizing their relationship beyond what it ever was. And that’s a fair assessment. In the years since he’s lost her and last season when he was so desperate to bring her back, there was always this suspicion that he was now retroactively painting this rosy picture of how everything used to be. It’s definitely refreshing that Jessica isn’t going to take any of Wyatt’s crap. It makes things a little better for us Lucy/Wyatt shippers, but more than that, we know that this is vital for Wyatt’s character growth. This entire episode is just the beginning of him sorting through his life and trying to decide what he wants. We love him because he’s loyal, and he’s attempting to do the honorable thing where Jessica is concerned—that’s just who he is. But at the same time, what transpired between him and Lucy last episode and all of those feelings between them can’t just go away overnight. He’s not the same person he used to be because of her and his experiences traveling through time. It’s difficult for Lucy to hear about Jessica from Wyatt (that single, heartbreaking tear that falls down her cheek says it all), but she’s mature about it…and handling it more quietly than all of us. She’s selfless and strong, considering Wyatt’s happiness even when he escaped the bunker without a word. The rest of the team is alternately shocked/confused at the news because shifting timelines are weird and events have been screwed up. The team concludes that Rittenhouse must have been responsible for stopping Jessica’s murder; an hour-long trip to 1980 San Diego in the Mothership’s logs raises all kinds of alarm bells. So, how did they do it? Is Jessica now a part of Rittenhouse? (That seems likely now more than ever.) Could she be a sleeper agent? They can’t stand around and debate the possibilities because the Mothership has landed in 1692 Salem, Massachusetts…on the deadliest day of the witch trials, no less. Now that Wyatt’s off dealing with his own crisis, Rufus and Lucy need a third person to round out their time traveling trio. “We’re going to colonial New England,” Lucy reasons. “A woman and a black man should travel with someone who has more access.” Garcia Flynn is more than eager to offer up his services, pleased that Lucy is the one who’s on board with the idea. For the record, everyone else is really not into it. Least of all is Rufus, who spends their trip trading razor sharp banter with Flynn. Flynn gets in his fair share of sass, too, and it’s not long before we’re actually finding his presence in this episode rather enjoyable. He’s less broody than season one and comfortably settles into the role of antagonist/ally. His and Wyatt’s methods differ, of course, but he shows up when he’s needed to rough someone up. Timeless succeeds in capturing all of the paranoia of the Salem Witch Trials, the panic and fear of the unknown, this idea that something can spread based on fabricated stories and wrongful accusations. Amid all of the misconceptions that surround this historical event, Timeless wades through fact and fiction. And yet, a single twist in the history (tweaked just a little in favor of fiction) is what sets the new trio on their mission—Abiah (Folger) Franklin (Sofia Vassilieva) finds herself one of the accused witches slated for execution. Needless to say, the untimely death of Benjamin Franklin’s mother would cause irrevocable damage to American history. “Franklin made it okay for us to criticize the people in charge,” Lucy says, a line that drives home one of the ways in which this series has been relevant and so very important. “It’s a step toward tyranny,” she concludes. We always figured as much, but now more than ever, Rittenhouse is an uncomfortable but totally necessary allusion to today’s political landscape. It’s such a subtle thread in this episode, but it proves just how Timeless utilizes the past to make you aware of the present…and the future. Lucy, Rufus, and Flynn determine that whoever accused Abiah is in league with Rittenhouse or one of its sleeper agents. Rufus spots their first suspect in Ingersoll’s Tavern: a guy with a scar on his face. Jiya told him that he’d be responsible for the man’s death, a glimpse from one of her time travel visions that saw Rufus shooting him. Jiya couldn’t have kept these visions from Rufus for long, but they’re already starting to put a strain on their relationship. 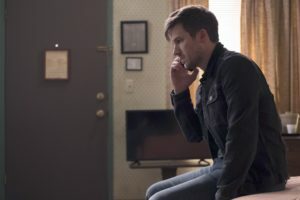 It’s another quiet character thread, but it’s woven so deftly through this episode that it shouldn’t be missed next to the Lucy/Wyatt/Jessica drama. When Puritan Guy isn’t the accuser after all, Lucy and Flynn set their sights on Abiah’s sister Bathsheba (Folger) Pope. This gives Abigail Spencer the opportunity to deliver the line “Cut the crap, Bathsheba!” which is probably one of the funniest snippets of dialogue this season so far. And with one silent nod of her head and a raised eyebrow, Lucy sends in Flynn as her muscle. Flynn’s been itching to use his fists since they set foot in Salem (but what he actually wants is a musket or rifle), so he makes quick work of it. But neither Bathsheba nor her husband are Abiah’s accusers. That honor goes to Carol Preston, Lucy’s mother. And it’s Lucy’s own mother who hurls an accusation of witchcraft at her daughter. As if Carol hasn’t hurt Lucy enough this season already. She drops by the jail where Lucy’s been imprisoned with the other accused women, begging her again to join Rittenhouse. There’s no sleeper agent in Salem, just Carol, who’s been sent by Nicholas Keynes to take Lucy out. There’s no love lost between dear old Grandpa Rittenhouse and his great-granddaughter…or his granddaughter, either. The conflict is indeed brewing between Carol and the man she thought she admired. (Also, what the hell is going on between Emma and Grandpa Rittenhouse?). Carol slips Lucy a knife to help her escape, but Lucy isn’t joining Team Rittenhouse—she’d rather hang. Awaiting execution with the rest of the women, Lucy offers a bit of comfort, an inspiring speech that reminds us why we love Timeless and our favorite history nerd Lucy Preston. She praises them for their eccentricities, their traits that make them different, and their willingness to stand out when others don’t know what exactly to make of them. Their eccentricities aren’t a crime, and Lucy is proud to embrace her own unique qualities and join them. It’s jarring to see Lucy waiting her turn for the gallows, solemn though she and Rufus are working through their ropes with the knife from Carol. They cut it close—the noose is literally around Abiah’s neck—before Flynn swoops in to save the day. He gleefully procured a rifle from Bathsheba and her husband (by use of force, but that probably goes without saying) and breaks up the scene by firing at those responsible for the hangings. In the chaos, Lucy surprises Rufus by not sticking to the historical script; they decide helping the accused women escape is more important than preserving historical accuracy. Lucy’s changed quite a bit since season one! (Their changing history has immediate effects: Jiya later reveals the event is now called The Salem Witch Revolt, and the term “witch hunt” no longer exists. Score for Timeless with that jab at the often politicized phrase). Lucy survives the ordeal but gets clipped in the arm by a knife for her efforts. She keeps going, of course, but the injury leaves her a little shook. Rufus finds himself locked in a standoff with the guy he’s predestined to kill, and in an effort to rewrite the ending, he spares the man’s life. He wants the man to walk away and go home to his young daughter. And he almost does. But fate, apparently, has other ideas, and the man is trampled moments later by a spooked horse and runaway carriage. Tearfully, Rufus wonders aloud what went wrong, his hands stained with the man’s blood anyway in his effort to revive him. At the bunker, Rufus and Jiya discuss the line between fate and rewriting one’s history (or any history, a core theme of Timeless) and Rufus decides he’d rather not know about what Jiya might see. Meanwhile, it’s getting rather crowded in the bunker… Lucy spots Jessica the moment she steps out of the Lifeboat, and worse, Wyatt “You haven’t lost me” Logan backpedals the second Flynn shadows Lucy. …Ouch. Wyatt insisted on bringing her to work to prove to her that this whole time travel business is real. We know you’ve been married to her, Wyatt, but your new history together is shaky at best and maybe you should vet her before letting her into the team’s top secret bunker?! Agent Christopher’s look of disdain is priceless. Jessica does fangirl over Connor Mason, and she sees the Lifeboat in action with her own eyes, but the idea of her just taking it all in stride seems impossible. It doesn’t make up for Wyatt’s past behavior even though he’s desperate to make amends. And if Jessica is Rittenhouse? That won’t end well for anyone. At least Lucy, who’s now lost everything again, is tentatively making friends with Flynn. He’s still a wild card, but it’ll be interesting to see how their relationship plays out over the course of the next few episodes. The rest of the Time Team might not like Flynn taking up space in the bunker, and Lucy might still harbor her own reservations toward him, but another friendship could do her some good. Flynn’s first outing with the Time Team was certainly badass, but we’ll be intrigued to see how these new timeline developments affect our favorite reunited trio next week.